We LOVE Halloween – women dressed up as hot vampires – yes please. But, hot women aside ?, at the ripe age of late 20 something (*cough* early 30s) do you really need all the heavy sweet eating and bad treats? 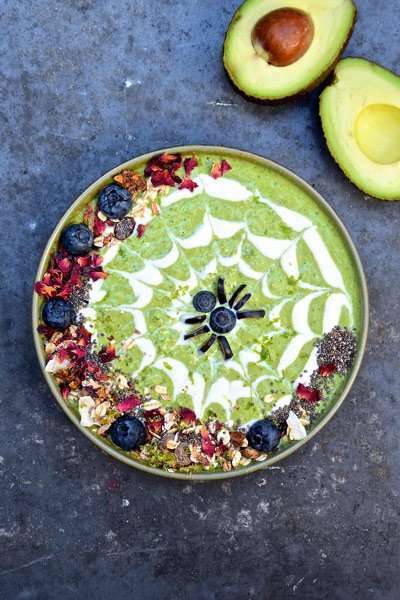 With that in mind and without taking the fun out of halloween we’ve teamed up with the World Avocado Organisation�and�Colette Dike�of Foodeco to provide you with healthy yet fun Avocado Halloween recipes that will please your inner child and satisfy your bikini bod dreams – win win. Melt the chocolate in a bowl over a pan of hot water. Turn a glass (or jar) upside-down and spoon a generous amount of chocolate along the upper rim of the glass. Rotate the glass until you’ve coated the entire rim. Now turn the glass right side up, and the chocolate will run down the sides. Make sure you’re close to the freezer. When the chocolate resembles ‘Frankenstein’ hair, put the glass in the freezer and leave in there for at least 5 minutes. Repeat with the second glass. 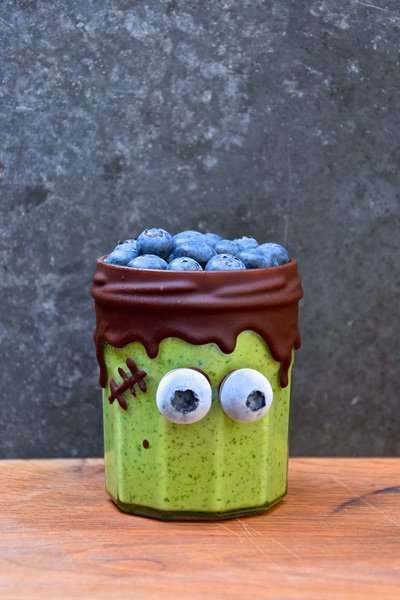 Remove the glasses from the freezer and using a small drop of the melted chocolate, stick on 2 blueberries on to the frozen glass to create Frankenstein’s eyes. Repeat with the second glass. Optionally make a stich with the chocolate and a skewer (as seen on photo). Put both glasses back in the freezer for another 5 minutes. Meanwhile, to make the smoothie, blend all the ingredients in a food processor until smooth. Pour the smoothie into the glasses (or jars), add blueberries on top and straws to finish. Serve immediately. Blend all the ingredients for the smoothie in a food processor until smooth. Pour the smoothie into small bowls. Use the coconut yoghurt to make the ‘spider web’. Start with a small circle of the yoghurt in the middle of the smoothie bowl and then continue by making 3 circles around this central dot. Use a skewer to draw lines from the middle circle to the outside of the bowl, making as many lines as you like. Create a spider by putting 1 big (body) and 1 small (head) blueberry in the middle and cut 8 legs out of 2 big blueberries, put the legs around the body of the spider. Repeat with the second bowl. Decorate your smoothie bowls with the toppings and serve immediately. Toast the bread, remove the crusts, 12 long fingers out of two of the toasted slices (1.5 cm wide). Use the third piece of toast to make the ‘dirt’ by blending the toast in the food processor and mix until it looks like ground earth. Cut the avocado in half and remove the pit, mash the avocado and season with salt, pepper and chili flakes to taste. Sprinkle the ‘dirt’ on a plate, spread some avocado mash on the fingers. Finish by sprinkling the paprika or cayenne powder on top of the finger and add the almond ‘nail’ on top. upside down. Preheat the oven to 180 degrees Celsius. 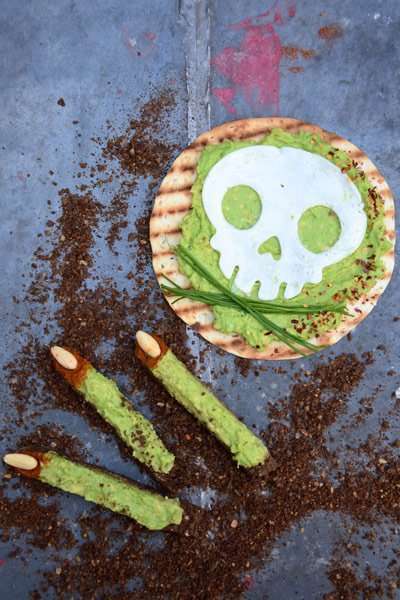 Use the olive oil and cover both sides of the tortillas and cut out spooky Halloween shapes. Put the cut out tortilla wraps on a baking tray covered with the baking paper. Sprinkle them with some curry powder and bake for roughly 7 minutes until they are crispy. Meanwhile wash the cauliflower and remove as much of the stem as possible. Prepare your favourite guacamole and stuff the cauliflower. 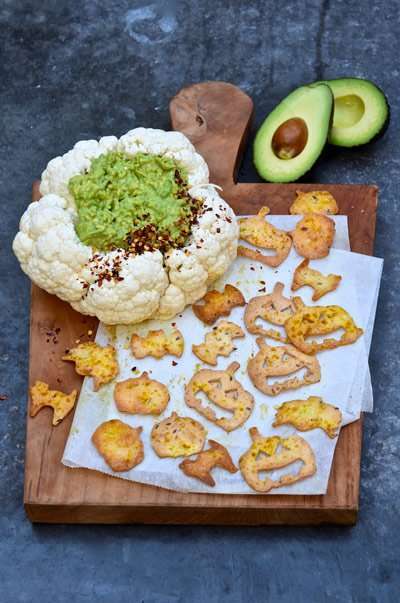 Serve the tortilla crisps with your cauliflower brain dip! And there you have it, what a sophisticated woman you’ve become ?- we’re so proud. Let us know how you get on by commenting below.